Newspapers and magazines that played a leading role in the education and modernization in the late Chosun period will be designated cultural properties, the Cultural Heritage Administration announced on Monday. 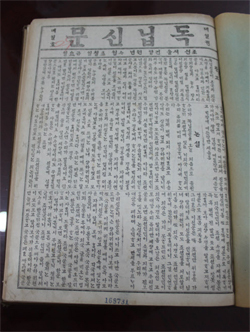 The six dailies include the Hanseong Sunbo, Korea's first Korean-language newspaper and Tongnip Sinmun, Korea's first privately-managed modern daily, along with two magazines that contributed to the independence movement against Japanese colonial rule and modernization thereafter. First published in Oct. 31, 1883, the Hanseong Sunbo carried world news and introduced the advanced culture and systems of government of foreign countries. The Tongnip Sinmun founded on April 7, 1896 drew attention by innovative use of the Korean alphabet instead of Chinese letters, and horizontal writing. The CHA will make its official decision after gathering opinions from various experts for the next 30 days.